(Phys.org)—Many biological systems involve dense packing of a large amount of material or particles in a confined space. For example, eukaryotes' nuclei hold about two meters of DNA that is tightly wound into chromosomes. On the larger scale pharmaceutical packaging, manufacturing, and transport all involve trying to pack the most amount of material within a small space. Furthermore, nanotechnology and material sciences are concerned with particle packing and layering. While the concept of packing the most amount of material in a small space is simple, understanding how particles of various shapes pack is not. To discern how various anisotropic solids pack within a confined space, Erin G. Teich, Greg van Anders, Daphne Klotsa, Julia Dshemuchadse, and Sharon C. Glotzer of the University of Michigan, conducted Monte Carlo simulation studies to examine how Platonic solids pack three-dimensionally within a sphere. They compared these clusters to clusters of spherical particles packed within a sphere and found that unlike cluster packing in infinite space, within a closed container particle shape is less influential on the structure of optimal packings. 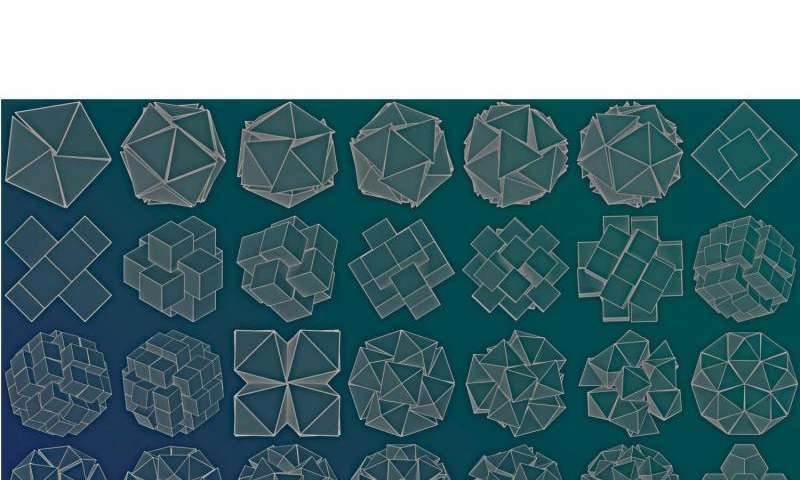 Instead, the structures of optimal packings are significantly affected by the shape of the container, and clusters made of different particle shapes adopt similar optimal structures in a variety of cases. Additionally, they found that there are certain numbers of particles, or magic numbers, of a given shape that correspond to particularly high cluster densities. Their work appears in the Proceedings of the National Academy of Sciences. Their initial studies compared the densest packed clusters of each of the Platonic solids with clusters of spheres. Cluster packing can occur in various geometries and layers. Similarity to sphere cluster packing was determined using mathematical methods. Of the Platonic solids, the icosahedron had the greatest number of cluster geometries that matched closely to clusters of spheres, and, indeed, its three-dimensional shape is most closely spherical. The other shapes progressively decreased in similarity to sphere cluster packings with dodecahedra having several similar geometries, followed by octahedra, and then cubes. No clusters of tetrahedra were structurally similar to their corresponding cluster of spheres. Teich, et al. found that the clusters of particles that most resembled clusters of spheres typically packed in layers of optimal spherical codes, demonstrating the influence of the container shape on optimal packing structure. An optimal spherical code at a particular value of N is a way of packing N spheres most tightly inside a spherical shell. Interestingly, both bulk icosahedra and dodecahedra packed in layers of optimal spherical codes in a majority of cases even though they are dual to each other, or the faces and vertices are switched on these two shapes. One would expect "opposite" packing, but instead, both adopt optimal spherical code layering, which indicates the container is more important than particle shape. Studies looking at cluster density provided several insights. First, as expected, cluster density increases as the number of particles increases until the particles approximate a spherical shape. Then, density increases much more slowly, expected to level off as the number of particles goes to infinity. Additionally, there are certain numbers of particles at which density significantly increases. These numbers differ for the different particle shapes. At these particular particle numbers, deemed magic numbers, the cluster density is larger and is greater than the cluster density for clusters with one less or one more particle. "Our results show that polyhedra adopt an incredibly diverse array of cluster structures merely when we force them to pack inside a sphere, the simplest type of three-dimensional container," says Erin Teich, lead author of the study. "Not only are these clusters experimentally relevant, but they also demonstrate the tightly-coupled relationship between packing structure and the packing environment. This relationship has only just begun to be explored- we plan to tackle it by examining clusters formed by different particle shapes packing in a variety of confining geometries." Teich, et al. 's results reveal that contrary the hypothetical case in infinite space, spheres are not necessarily the worst packing particle within a confined space, and unlike three-dimensional packing on in infinite space, packing within a confined space depends less on particle shape and more on the ability of the particle clusters to take on the container's shape. Some of the cluster symmetries observed here demonstrate optimal density and packing within a particular confined space, which has implications for analogous biological and material systems. Dense particle packing in a confining volume remains a rich, largely unexplored problem, despite applications in blood clotting, plasmonics, industrial packaging and transport, colloidal molecule design, and information storage. Here, we report densest found clusters of the Platonic solids in spherical confinement, for up to constituent polyhedral particles. We examine the interplay between anisotropic particle shape and isotropic 3D confinement. Densest clusters exhibit a wide variety of symmetry point groups and form in up to three layers at higher N. For many N values, icosahedra and dodecahedra form clusters that resemble sphere clusters. These common structures are layers of optimal spherical codes in most cases, a surprising fact given the significant faceting of the icosahedron and dodecahedron. We also investigate cluster density as a function of N for each particle shape. We find that, in contrast to what happens in bulk, polyhedra often pack less densely than spheres. We also find especially dense clusters at so-called magic numbers of constituent particles. Our results showcase the structural diversity and experimental utility of families of solutions to the packing in confinement problem. Plasma vision of the Universe 1993 interlinks RNA-DNA-Bio-energy Plasmas, YOGA. Plasma Regulated Electromagnetic Universe 1995 outlines a broad area.